"The positive start they make in the early years, especially in developing their personal and social skills, prepares them very well for learning." We have a 60 place Foundation Stage Unit with Nursery and Reception children. Within the unit we have four family groups. Each group is led by a key person who has special responsibilities for working with a small number of children. This term our theme is ‘Extraordinary Journeys!’ This topic will give the children lots of opportunities to explore and investigate the theme of travel and places. The children will also have lots of opportunities to listen to, read and retell adventure stories. We want to make learning exciting for your child and so welcome any ideas from home. If you have any suggestions please speak to a member of staff. You can download our intended learning for the Autumn term below, along with our newsletter. Taiarna from Reception, was invited by Miss Shah as a special treat to enjoy juice and biscuits. Taiarna had wrote Miss Shah a letter about a slug that was loose in our school. Taiarna had a great time!! Article 29- Your education should help you use and develop your talents and abilities. It should also help you learn to live peacefully, protect the environment and respect other people. Parents and Carers were invited to come along and play games and have fun with their child. The children and adults participated in activities and find new exciting ideas about playing with their children. Everybody had a fantastic time! They have enjoyed retelling the story to their friends using the cd. We have also planted our own beans and the children are hoping they grow into beanstalks like Jacks. The children thought about what could be at the top of this beanstalk and enjoyed looking at how he planted his bean which helped us plant our own. Article 17- You have the right to get information that is important to your well-being, from radio, newspaper, books, computers and other sources. Adults should make sure that the information you are getting is not harmful, and help you find and understand the information you need. For World Book Day, the children were invited to wear a costume of their favourite book character or wear their pyjamas to represent bedtime reading. The children enjoyed listening to new stories throughout the day and some new stories that they had not heard before. At the end of the day, parents and carers were invited to come into school and share a story with the children. Article 29 – Your education should help you use and develop your talents and abilities. It should also help you learn to live peacefully, protect the environment and respect other people. The children had to move around the hall to different stations and find clues to help retell the story. The children had a wonderful time, here are some of our photographs from the visit! We have been on a walk in our local area to look at how we can safely cross the road. We learnt that we should always look right and then left and keep checking as we cross the road. In Nursery we have used 'Elfy Bear' to demonstrate what is safe and what isn't. We learnt about sharp objects and how to be safe in water. Article 27- You have the right to food, clothing, and a safe place to live and to have your basic needs met. You should not have to be disadvanted so that you can’t do as many of the things other kids do. The children in Nursery have been looking at the story 'Whatever Next!' as part of our 'Extraordinary Journeys' theme. The children have been pretending to fly to the moon in their own cardboard box spaceships, they have been dressing themselves in spacesuits and shooting off to space on an adventure. They even had picnics on the moon, just like Baby Bear in the story. As part of their homework, they were asked to make their own spaceship or alien at home with an adult or family member. The children created some amazing spaceships! They were very excited to show them in assembly to the whole school. Reception enjoyed a day playing in the snow, they even made their own snowman. Article 31- You have the right to play and rest. 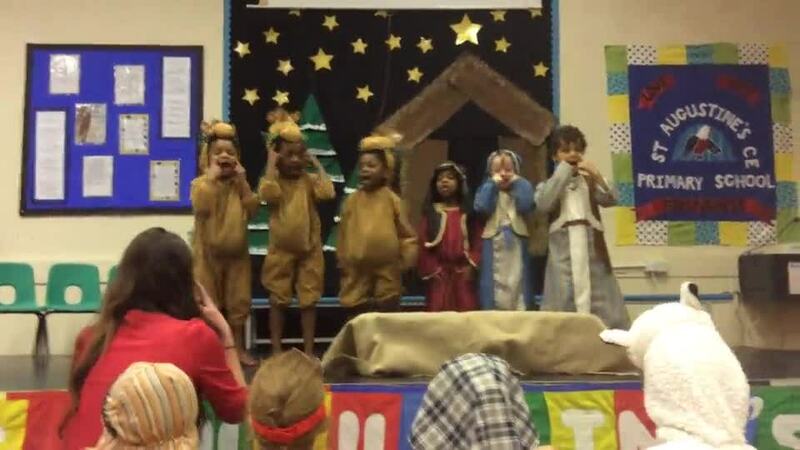 The children in Reception performed 'The Sleepy Shepperd' about a Shepperd who went to Bethlehem to see Baby Jesus. 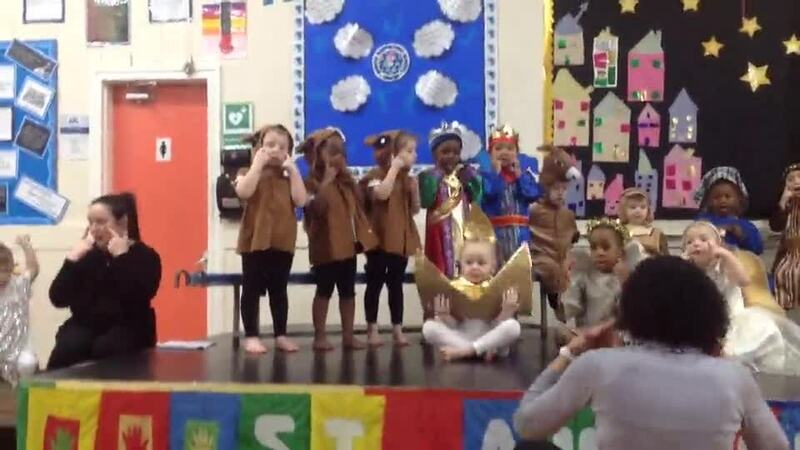 All of the children had a wonderful time performing on the stage for the Parents and Carers. Article 30- You have the right to practice your own culture, language and religion – or any you choose. Minority and indigenous groups need special protection from this right. On Friday 16th November, the children celebrated Children In Need and the end of Friendship Week. They were able to come into school in their pyjamas and bring their own teddy bear into class to raise money for the charity. To finish friendship week, we had our own friendship feast. Some of the Nursery and Reception swapped classes for lunch and had a delicious picnic. The children in nursery enjoyed a game of pass the parcel to demonstrate sharing and taking turns. Each child received a chocolate and a lovely message about being a good friend. The children had a brilliant day, here are some photos of our celebrations! Article 8- You have the right to an identity- an official record of who you are. No one should take this away from you. Article 15- You have the right to choose your own friends and join or set up groups, as long as it isn’t harmful to others. Parents and Carers were invited to come along and play games and have fun with their child. The children and adults participate in activities and find new exciting ideas about playing with their children. Thank you to all of the parents and carers who came along, the children had a fantastic time! As part of our theme 'Let's Celebrate' we have had our very own Diwali Party. The children have been looking at the Diwali story of Rama and Sita. They have learnt why we celebrate and the meaning of Diwali. They prepared for this by making their own decorative necklace to wear and decided what foods they would like to enjoy. We had special dancing in the hall and played fun party games. Article 14- You have the right to choose your own religion and beliefs. Your parents should help you decide what it is right and wrong, and what is best for you. 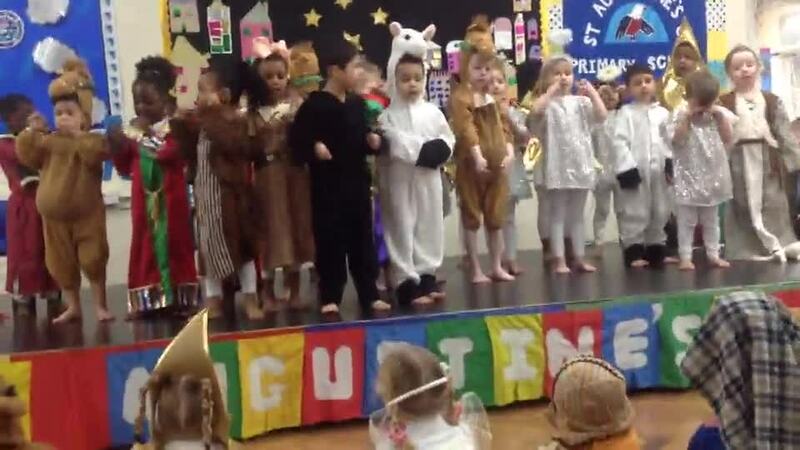 In Foundation Stage, we have celebrated our very own carnival. To prepare for it, we have looked at videos of children celebrating at carnivals and what they do. We made a list of the things that we thought we would need and chose the yummy food we wanted to eat. 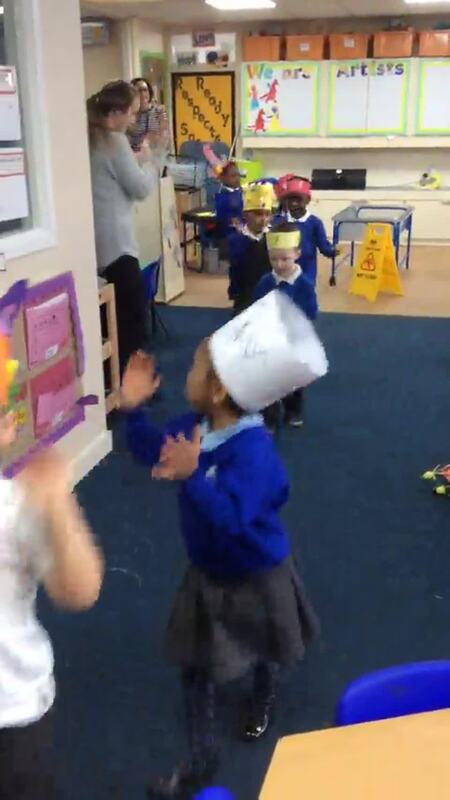 The children also made some party hats to wear, they could come into school wearing their own carnival party clothes. We ate lots of delicious carnival food, like rice, chicken, special mango ice-cream and fruit salad. During our special celebration, the children watched the Year 6 children perform their drumming routine. At the end they played music for us to dance to. Here are some photographs from our special celebrations! Welcome to our new Nursery children, the children have settled into the setting very well. Here are some photographs of the new children and our existing Reception children enjoying their time in our Foundation Stage. This year for our Eid celebrations the children had their own Eid party. They enjoyed a delicious picnic outside trying some new foods. For sports day, the children took part in a number of activities such as javelin, a relay, sack races, and an egg and spoon race. We gathered in small groups and moved around the course one obstacle at a time. We invited our parents and carers to come along and watch they also took part in a race. Article 24-You have the right to the best health care possible, safe water to drink, nutritious food, a clean and safe environment, and information to help you stay well. This week the children in Foundation Stage have been looking at how to make their diets much healthier. They made their own healthy plate of fruit and vegetables. In Nursery we made a fruit salad. The children made a list of the fruit that they would like to add. They chopped and peeled the fruit before enjoying the yummy fruit salad. Another part of our Healthy Eating week has been a visit from a Dental Nurse. She came into Foundation Stage and talked to the children about how we can be healthy and look after our teeth. She demonstrated how to brush them properly and spoke about some foods that are kind to our teeth and what to avoid or have as a treat. Some children dressed up as a dentist and patient and pretended to examine their teeth like a real dentist. All of the children took home a new toothbrush and some toothpaste. In Foundation Stage we have been on our class trip, we went to visit Manchester Airport. We were able to go inside a real plane and sit where the passengers sit on a plane. We were shown what planes looked like when they were invented and how they have changed and what they look like today. We even dressed up as different members of staff that work in the airport and help to keep it running smoothly and safely. These included the Captain and cabin crew, the people that signal the planes and help with our luggage. We learned that each airport has their own police and fire service, we dressed in their uniforms and heard what their roles included. We also took turns and went into the cockpit to see where the pilot sits and all of the equipment they use to fly the planes. We moved into the Concord hanger, we looked at the plane and all of its features to help it move so quickly. We looked at many planes and then moved onto the runway to look at the planes taking off. The children were told that the biggest plane in the world was taking off very soon, we waited very patiently and saw it take off into the sky. The plane was so big that it could hold all of the children at St Augustine’s as well as all of our Parents and Carers. The children had a very exciting day at the airport, they learnt lots of new interesting facts and saw lots of different planes. Here are some photographs from our day! Article 28 – You have the right to a good quality education. You should be encouraged to go to school to the highest level you can. Reception class have begun their P.E lessons in the previous term, they have been using the hall and it's equipment to find interesting and creative ways to move around the space. Please ensure your child brings their P.E kit into school, they need a white t-shirt and black shorts. The kits will be left in school and sent home each half term to be cleaned. This year for Soccer Aid, the children wore their P.E kit or a football kit. Children in Foundation Stage practised some of their football skills outside with Mr Percival. The children took penalties and tried to score a goal. Foundation Stage's New Outdoor Area! Foundation Stage's outdoor area has been re-developed and made much more exciting for the children in our school. We have gained lots of new equipment and resources that the children are enjoying very much. The area was carefully planned and designed by staff at school and the construction company with the children's growth and development in mind. We have a new climbing frame, which will enable the children to learn new skills balancing and moving around the area creatively. There is also a new and exciting mud kitchen, it offers lots of space for resources and mimics a real kitchen which the children can enjoy making lots of exciting creations. We have a new water area and also some new den making equipment using logs. The children are enjoying their playground very much, here are some photographs of the area and the children having lots of fun! Article 31 - You have the right to play a rest. 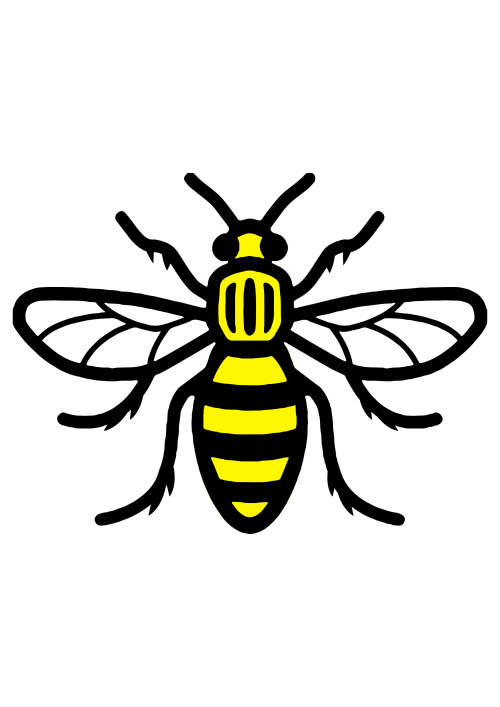 In Foundation Stage, our children came to school wearing clothes that they believed represented Manchester. We ate food from Manchester, we had chips, mushy peas and Manchester's very own vimto juice. The children really enjoyed trying these foods from our city. There was also a whole school picnic outside that everybody enjoyed. As a school, each class chose a song from Manchester to perform, Nursery chose 'The big ship sails' as it originates from the Manchester Canal. Reception performed One Direction' 'You don't know you're beautiful' as one of the bands members comes from Manchester. It was a wonderful day, looking at what makes our city so special. Here are some photographs from our celebration in Foundation Stage. Article 6 – You have the right to be alive. Article 14 – You have the right to choose your own religion and beliefs. Your parents should help you decide what is right and wrong, and what is best for you. Article 37- No one is allowed to punish you in a cruel or harmful way. The children looked at what the Guide Dogs role was and how they helped people. We decided to raffle off a 'Mummy and Puppy' set. The children bought a raffle ticket and the money went towards the charity. In total we raised £33.50, that meant that our money could buy a white harness to show people that they area qualified guide dog. Parents and Carers are invited to come along and play games and have fun with their child. The children and adults participate in activities and find new exciting ideas about playing with their children. Article 5 – Your family has the responsibility to help you learn to exercise your rights, and to ensure that your rights are protected. Here are some photos of the children in Foundation Stage enjoying the outdoor resources. The children in Reception have been looking at pirates in their group times and have been dressing up in pirate costumes, as part of their outdoor green challenge they had to construct their own pirate ship. The children in Nursery have enjoyed joining in too. Some of our Reception children have been participating in a cooking club. So far they have made cheese and hummus wraps and their own pizzas. They have carefully chopped their own ingredients and tried some new food that they had never tasted before. Article 24- You have the right to the best healthcare possible, safe water to drink, nutritious food and a clean and safe environment, and information to help you stay well. Article 27- You have the right to food, clothing, and a safe place to live and to have your basic needs met. You should not be disadvantaged so that you can’t do many of the things other kids can do. They looked into the pond and they saw some Tadpoles swimming. We brought the Tadpoles back into the classroom and placed them carefully in the tank. We also put some rocks and pond weed into the tank to help the Tadpoles to grow. When the Tadpoles are much bigger and their front legs have formed, we will release them back into their pond. 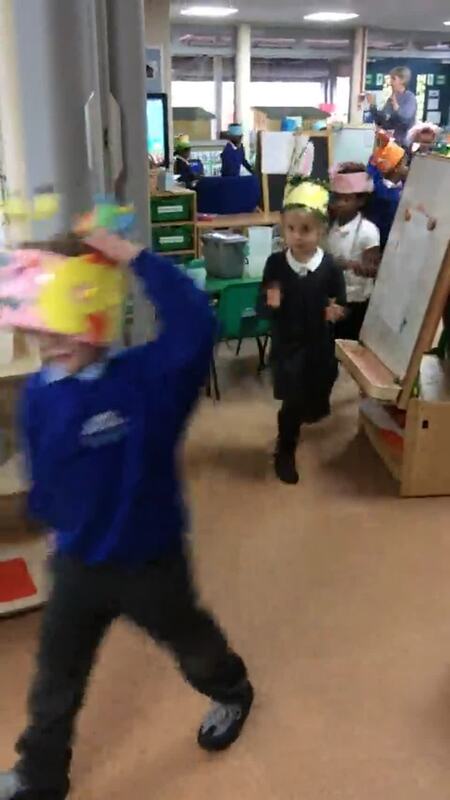 In Foundation Stage as part of our Easter celebrations we had an Easter bonnet parade. The children made their hats at home and brought them into school for the parade and a bonnet making competition. The hats were judged by Miss Khan, she picked two children from each class. The four winners won an Easter egg. Article 14- You have the right to choose your own religion and beliefs. Your parents should help you decide what is right and wrong, and what is best for you. We have looked at many stories, one of those stories has been Cinderella. 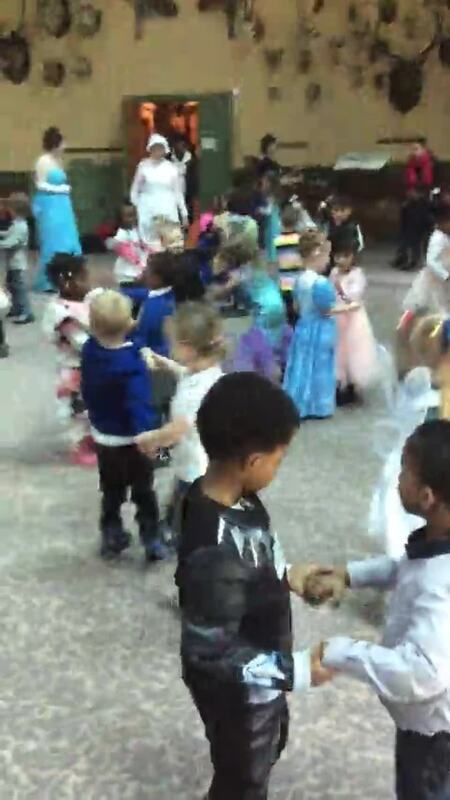 The children received an invitation from Prince Charming inviting them to attend his ball at his mansion. The children dressed in their fairytale clothes and partywear to attend. We received a tour around the mansion looking at the rooms where Cinderella lives as a princess. We also looked at the cellars and kitchens where she lived before she met the prince. We met some characters at the mansion including, Cinderella, the Queen, The Fairy godmother and Jones the servant. 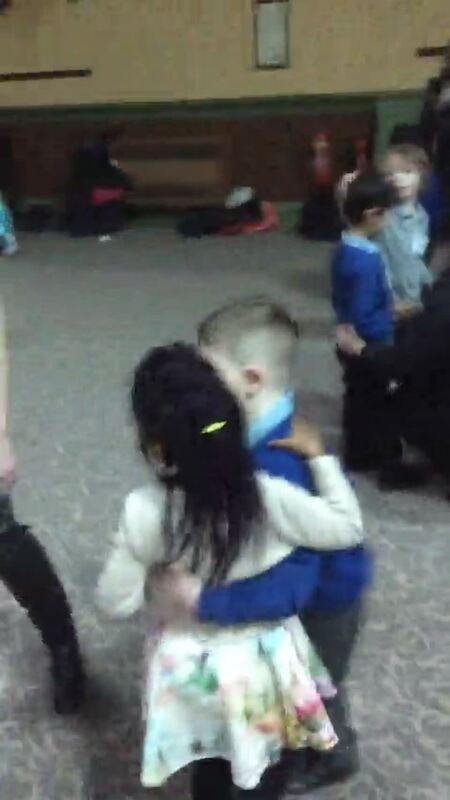 We performed our very own waltz for them in the ballroom. At the end of our tour we had lots of fun playing on the adventure playground. Here are some of our photographs from our wonderful day. In Foundation Stage, we have been working hard on developing our outdoor learning. We have added lots of new equipment and have added some new learning sheds filled with fun resources. We have a construction shed, maths and writing shed. The children in Year 2 have been looking after some chicks in their classroom. The children in Nursery enjoyed a special visit from the chicks. They looked at the incubator where they live and what kinds of food they eat. They listened very carefully about how to handle the chicks and keep them safe. The children gathered in a circle and a chick was brought over to them, they each took turns to stroke a chick. A chick was placed in front of the children, they looked at how it moves and its wings. The children loved having the chicks visit their classroom. Reception went to visit the chicks in their classroom, they looked at the chicks and had a chance to stroke them, Some children got to hold the chicks carefully. When the chicks were ready to leave Year 2, Reception volunteered to look after them and find them new homes. The class helped to feed them and clean their box out. They were very careful when handling the chicks and enjoyed letting them out and watching them move around the carpet. The children in Foundation Stage enjoyed a story hunt when the Freshwater Theatre came into school for a visit. At the end of the session, some of the children acted out a story. The children used instruments to create sound effects and their own props. Our class story for this years World Book Day has been the Gingerbread man. The children have enjoyed looking at this story and learning about how to make their own gingerbread. Together they looked at what ingredients they would need and measured and mixed it all up. The children cut out their shape and an adult baked it in the oven safely. The children made their plans on how they would like to decorate their gingerbread. They used dried fruits, chocolate and icing. When they were all finished, the children enjoyed eating their own Gingerbread man. They tasted delicious!! Article 27- You have the right to food, clothing, and a safe place to live and to have your basic needs met. You should not have to be disadvantaged so that you can’t do as many of the things other kids do. The children could come to school dressed as their favourite character or in their pyjamas to represent bedtime reading. Parents were invited into class to read with their child, here are some photographs of the children in their costumes. This week was a very exciting, we had Shrove Tuesday, Valentine’s Day and Chinese New Year. For our own celebrations we have done some cooking. Each child participated in making a different dish for each of these celebrations. For Pancake day some children made pancakes, they measured and mixed the ingredients and left an adult to cook the pancakes. We made jam tarts for Valentine’s day, the children mixed the butter into the flour and added some water to make the dough. They used a pastry cutter to form the shape and added some jam and topped it with some more pastry. Once the jam tarts had been cooked and cooled, the children tasted them. They said they were delicious. For Chinese New Year, some children had the chance to make some Chinese noodles. The children cut up the vegetables and made a Chinese sauce. It was mixed with the noodles and tasted by all the children. We also enjoyed some fortune cookies also, the children enjoyed listening to their fortunes from the cookies. One of the activities that they have took part in was making their very own porridge. They measured their ingredients out and carefully made the porridge. They enjoyed tasting the porridge afterwards with some honey. One of the things they did was make their very own Gingerbread man. They looked at the ingredients that they would need and made a list. The children each made a plan for the gingerbread man, they thought about how they wanted to decorate it and created a plan to follow. They gathered in small groups and measured and mixed the ingredients into a dough that they cut into the correct shape. Once they had been baked in the oven, the children followed their plan and decorated them using icing, chocolate chips and dried fruits. This week Nursery went on a shape hunt in the outdoor area. They had been looking at different shapes and how we can recognise them. They worked hard to look around and search all over the outdoor area. The Children managed to find some squares, circles and triangles during their search. They even recognised the shapes on the towers next door to our school. To celebrate our Christmas party, we came to school in our own party clothes, we also made our own party hats to wear to the party. We had a disco and enjoyed some yummy party food. 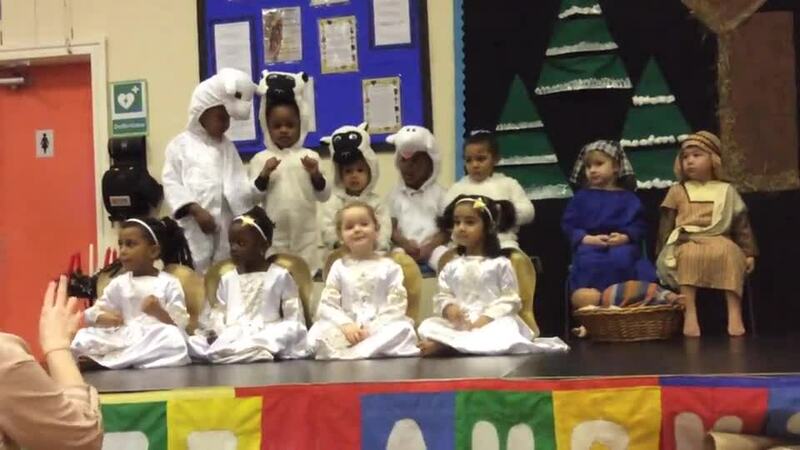 This year as part of our Christmas celebrations, Nursery sang some songs as part of the Christmas performance. They sang 6 songs in front to the school and also performed for their parents. They worked really hard on their songs and learning all of their lines! Here are some photos and videos of our show. In our key groups we went exploring and on our very own bear hunt in our school grounds. We started in Foundation Stage and looked for clues to help us find the bear. On the hunt we found some scratches on the trees, we thought that the bear had been trying to climb the trees to find his honey. We found lots of interesting things on our hunt, we found his footprints in the mud and leftover fruit peel when he was hungry and had a snack. At the end of our hunt, we found his special cave in the forest, we left him some delicious honey to enjoy. A visit from Beth Tweddle! In Reception we are starting to introduce 'Rainbow challenges'. There will be a number of challenges each week for your child to take part in. If they complete the challenge then they can get themselves a coloured lolly stick. Each colour represents a different challenge. Your child is expected to read their guided reading books five times a week with a parent/carer. If they do this they will be given a plain coloured lolly stick to go into their challenge wallet. Please make sure you sign your child's reading diary so we know when they have read at home. If your child receives all of their lolly sticks within the week, they will get a reward! This week our yellow challenge has been estimating! The children are to try and estimate how many Numicon pegs are in the jar and write the number down on a mini whiteboard. They then need to carefully count the pegs and check if they were right. The children know that 'estimating' means having a sensible guess! Have a look at some of our estimating.